Cleveland’s identity begins with the Western Reserve -- and may end with it, given recent talk of regionalism and “Cleveland+”. Without the Connecticut Land Company surveyor Moses Cleaveland, we wouldn’t have a name. Without that link to New England, we wouldn’t have a Public Square. Cleveland’s identity is inextricably connected to the Cuyahoga River, which made us ideally suited to be the main port linking the Great Lakes to the Ohio River via the Ohio and Erie Canal. Like the East, we experienced an influx of European immigration during the late 19th and early 20th centuries. Like the rest of the North, we experienced the Great Migration of African Americans from the South during the years 1910-1940. We prospered and grew and developed world-class cultural institutions. We built a lot of things here, and now, not so many. Like it or not, Cleveland is part of the Rust Belt, but it’s important to remember that unlike many of the small towns that popped up as a direct result of the American manufacturing boom, we were already sitting on nearly 200 years of history when things started to fall apart. If we have to fall, we’ve got good cultural bones to fall back on. 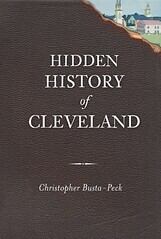 Still want to submit your own 200-word interpretation of Cleveland's historic identity? Email us at clevelandareahistory [at] gmail [dot] com.